Hunter Doherty Patch Adams is a physician who has never made a penny from medicine. He treats patients with laughter and loving, and he rebels openly against the tyranny of market capitalism. He said he is ashamed of the U.S. health care system. Its not about health. Its not about care. And its not a system, its a business. Adams spoke at the Tivoli Student Union on the Auraria campus Wednesday, challenging his audience to join his revolution of joy for the sake of their own well-being and that of the planet. You can decide to never have another bad day, said the mustachioed doctor wearing bright patterned clown clothes and a dangly earring. In the volumes of medical journals and peer-reviewed studies, Adams said, theres no evidence that its good for you to be serious. Theres no value to apathy, indifference, meanness, unkindness. Selfishness is never good for you. In contrast, the literature is full of evidence of the health benefits of joy, love, humor thoughtfulness, he said. A self-described provocateur, Adams rejects traditional medicines view of mental illness. To me, depression is never an illness, ever, he said. Its a pharmaceutical company diagnosis. Depression, he insists, is a symptom of loneliness. All you have to do to get rid of depression is have an active friend dancing in your head. Ive never disliked a patient enough to give them a psychiatric diagnosis or medicine. Instead, he said, he held one patient for 12 hours to calm him and treat him with compassion instead of drugs. Adams, who was hospitalized in his late teens when he was suicidal, said it wasnt until the third hospitalization that lightning struck and he realized, Dont kill yourself, dummy, make revolution. He completed medical school at the Medical College of Virginia in 1971 and founded the Gesundheit! Institute, which provides medical care for free. 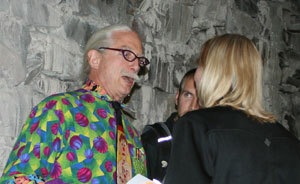 He most famously was the subject of the 1998 feature film, Patch Adams. Adams challenges his audience to embrace happiness. For the last 5,000 years, weve celebrated pain and suffering. History is about wars and winners and how bad the winners treated the losers, he said. Theres no party chapter. In religious training were taught theres salvation in suffering. We love pain and suffering. He considers it profoundly unhealthy. Being happy is not an ethical or a moral thing, he said. Its a damned old choice. And its clearly really good for you to be happy. Adams advocates communal living to increase friendship and human interaction, and to reduce costs and the impact of 7 billion people on the environment. The smartest thing I did was to start a commune in 1971, he said. It made all this possible. Despite his active decision to be happy, Adams said he experiences the full range of emotions, including sadness and anger. When I hold a child who is dying of starvation and has no muscle mass is just a sack of bones and doesnt have the energy to speak its hell. I want to tax the rich 95 percent, he said. Maybe its more important to love everybody than to have a thing. To get stuck in the pain paradigm of sad, sad, sad and angry, angry, angry is like masturbation, he said. Emotions should provoke action. His activism is focused on market capitalism. If we dont stop market capitalism, we will be extinct in this century, he said to applause. At 67, he said hes in the ice cream phase of life, so preventing the destruction of the planet must fall to the young. But at this point in life, hes not about to start withholding his opinions. Emotions are there to guide people. I trust them. When I hear someone heaping a pile of bs, I speak up. In response to a question from a medical student seeking advice on how to pursue a path of treating the poor outside of the for-profit health care system, Adams offered an audacious suggestion. If you owe $200,000 when you graduate, dont pay it. Work in Africa. Theres no such thing as debtor prison. Its what he did, he said. When he finished medical school, he wasnt making any money, so he didnt pay off his student loans. Later, when I started making money from other things, I paid it all back. Joy, he said, is a platform on which you launch your life. I dove into the ocean of gratitude and never found the shore.